As Spain’s capital city, Madrid is the biggest, the grandest and the most royal city in the entire country. It’s – without doubt – a beautiful, vibrant and very interesting city with so much to offer to both locals and visitors. From stylish restaurants, cafes and boutiques to an amazing nightlife, unique culture and traditional elements spanning centuries, visitors and locals alike will never get bored because the city has something interesting to offer everyone. In addition to the major tourist attractions that litter the city, the best part of living or visiting Madrid is getting acquainted with its countless inimitable neighborhoods. The city is made up of over 128 distinctive neighborhoods, making the city some sort of an enormous jigsaw puzzle. Known as the barrios, these neighborhoods are the city’s pieces and they somehow coexist seamlessly. Each of these neighborhoods brings a little something diverse to the city’s equation, making Madrid one of the most fascinating cities in the world. It’s no wonder then that more and more people decide to relocate to this vibrant city: Nestpick, the biggest search aggregator for mid-to-long term rental of furnished apartments, has helped thousands of expats and students relocate to Madrid, with more than 3000 apartment listings in the Spanish capital alone. Grand and bustling, Sol up towards Gran Vía is the liveliest part of the city. It is the most central point of the city and is classified as Kilometer Zero because the entire city’s building numbers and highway starts from Sol and is factually the middle-point of the entire Iberian Peninsula. In addition to the fact that the impressive Plaza Mayor and the grand Plaza de la Puerta del Sol (the Sun Gate Plaza) are based in Sol, this neighborhood is full of the city’s most iconic monuments and is home to some of the most popular shops and tourists spots in the city. Living in Sol, you will be a ten minute walk from Prado Museum, the Royal Palace, as well as those lovely places where you watch people in the Iberian sun while sipping a tinto de Verano or a café con leche at one of the many bars and restaurants in the city center. A stone’s throw away from Gran Vía, Chueca is the most colorful neighborhood in Madrid. For the last two decades, Chueca has become the LGBTQ neighborhood and is home to the trendiest shops, bars and restaurants. Many of the city’s youths, LGBTQ or not, head to this trendy neighborhood at night to its chic establishments to have fun in an utterly relaxed atmosphere. On top of having one of the trendiest nightlife scenes in the city, Chueca offers wonderful restaurants, outdoor terraces and utterly cool boutiques. Mercado de San Antón is one of the neighborhood’s main highlights. It’s a three-story gourmet food market offering a plethora of delicious food alongside an enchanting rooftop bar. You can as well enjoy the best that the neighborhood’s main street, calle Hortaleza has to offer. Another highlight is the Agusto Figueroa, which is a whole street of shoe stores. Enjoying this stylish and relaxed atmosphere while sipping some sangria on one of the city’s many outdoor terraces could become your favorite pastime should you decide to settle in Chueca. Also known as Huertas, thanks to its main street, calle Huertas, Barrio de las Letras is more than just a normal neighborhood. It is not only a five minute walk from Sol, but also the perfect place to start your night in Madrid. That’s because it’s lined up with all types of bars, whether upscale or wanting. Add this to the great restaurants and you’ll love this place to death. Once home to many of Spain’s well-known literary figures, Huerta still maintains the revered status of being the literary neighborhood of Madrid. There are a lot of sightseeing activities during the day. You can visit the death place of Cervantes, as well as Castellana, which is basically the city’s biggest boulevard. Visiting Restaurante Meceira known for its incredible Galician food, as well as a visit to Bar Populart – the city’s best jazz bar – could be one of your main pastimes in Huertas. Salamanca is what Upper East Side is to Manhattan. 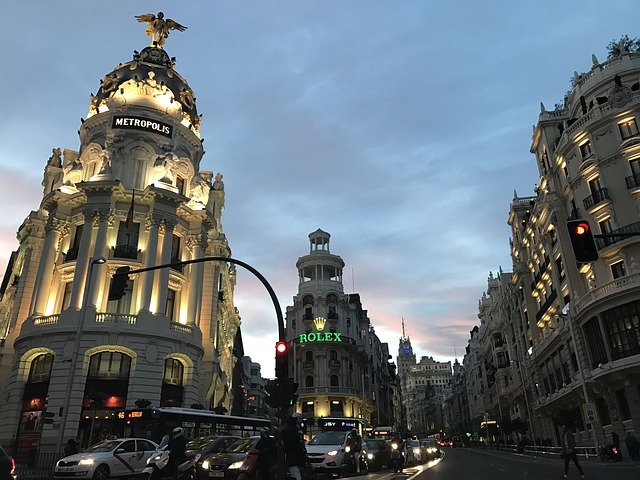 Located just above Retiro Park, this is the most affluent neighborhood in Madrid and is home to the world’s most renowned brands such as Versace, Dior, Gucci and Chanel. It offers the crème de la crème of Madrid’s shopping and nightlife. This is a much quieter neighborhood and offers prime real estate, high-end stores and top-notch restaurants. It is pleasantly a favorite playing spot for the A-list celebrities such as Real Madrid’s superstar, Cristiano Ronaldo. So if you are looking to live in a place where you’ll always rub shoulders with the likes of Cristiano Ronaldo while dining at one of the neighborhood’s elegant restaurants, the Barrio de Salamanca should be on top of your list. Old is gold, and that’s an adage that properly defines La Latina. This is a neighborhood that proudly boasts some of the oldest architectures in Madrid. Many of the buildings are 18th century buildings with very miniature streets that uniquely turn into stairways. Peculiarly, most of the restaurants in this neighborhood nicely take advantage of these staircases by placing tables out on each stairway. Apart from the finest cuisines that are always available in La Latina, this neighborhood becomes a buzz on Sundays. That’s because its well-known boulevard, La Cava Baja, is the place to be in Madrid on Sundays. This street turns into some sort of a charming carnival where tiny bars serve wines, tapas and caňas (draft beer). It has become a tradition for Madristas (people living in Madrid) to end up in La Cava Baja on Sunday afternoons to enjoy the best that La Latina tiny bars have to offer. To this end, there can be no doubt that Madrid is one of the most fascinating cities in the world. The city offers a myriad of neighborhoods that you can choose to live in. Each neighborhood has its own unique style, vibe and culture. No matter your choices and preferences, there’s a neighborhood for every taste and mood in Madrid. You can’t imagine living in any other city in the world.